May 19, 2011 Angela G.
The lovely leek is a tricky little bugger. While its cousin, the onion, smells fragrant and marvelous immediately upon entering the pan filled with butter or olive oil, the leek can be downright funky. But the patient are always rewarded for their efforts, and the leeks become luscious and silken if you let them hang out and do their thing. Crown this glory with white truffle oil and breadcrumbs toasted with a little butter and you are in for a real treat. In the words of Positive K, “I’m not waitin’ cuz I’m no waiter” – this holds true with this soup in that rather than fuss over it simmering on the stove, I let it come into its own with a little time in the pressure cooker. Once the soup is up to high pressure, you’re letting it cook for a piddly 5-7 minutes. That’s it. All of that freed up time allows you to make this as a freshly prepared first course with a (possibly) much more complicated entree to follow. I like having discretionary cooking time for more fussy majesty. A little beef wellington, perhaps? Begin by cutting the leeks in half and rinsing them well of any dirt or grit. Slice thinly. Set a pot over the stove, melt the butter and olive oil together and add the leeks. Season with white pepper. Add the potatoes and the vegetable stock to the pot and put the pressure cooker lid on top. Bring to high pressure and allow to cook away for 5-7 minutes. Let the pressure subside naturally. If you don’t have a pressure cooker, bring the pot to a boil and cook until potatoes are exceedingly tender, about a half an hour. 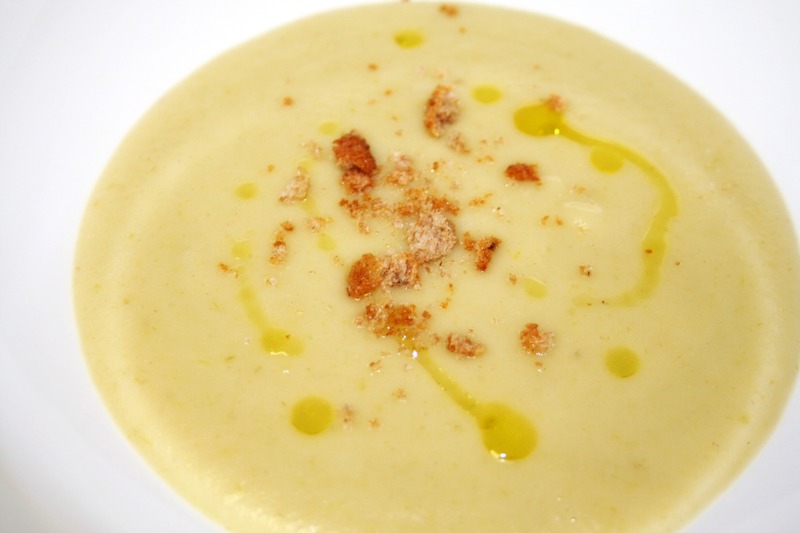 You can eat the soup with a rather rustic presentation by simply mashing up the large chunks with a potato masher. If you’d like a smooth soup, use an immersion hand blender (or a regular blender for that matter) to puree the soup, making sure not to overmix and turn the potatoes all gummy. Stir in the cream and serve with truffle oil and or toasted breadcrumbs (for crunch). Chop the leek tops, onion, carrots, parsnips and garlic. Add all ingredients to a pot and boil everything until fragrant and veggies are very soft – about an hour. Strain broth. If you’d like to use the pressure cooker, add all ingredients, lock the top and boil away on high pressure for 20 minutes. Let the pressure drop naturally and strain.